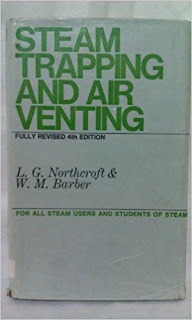 Inside front dust jacket flap: "This is a survey of the correct methods of draining condensate and venting air from steam lines and all types of industrial heating and process plant using steam as the heating medium. The draining of steam spaces of power units and the draining of water from compressed air lines and receivers have been dealt with also. It is not merely a guide to steam-trap types but a complete work of reference to steam-trapping practice and to the equally important development of air venting of steam-heated plant, and to the relation of both to plant efficiency and economy."